Hope Industrial Universal Mount Displays and Touch Screens (fully enclosed) are designed for maximum installation versatility. Whether as part of a standalone full pedestal workstation or mounted to a wall, post, or column, these displays can adapt to most industrial situations, providing a full IP65/66 (NEMA 4/4X) 3rd-party-certified solution. A standard problem with IP/NEMA-rated enclosures is passing the cables in and out of the enclosure while maintaining the wash-down certification. 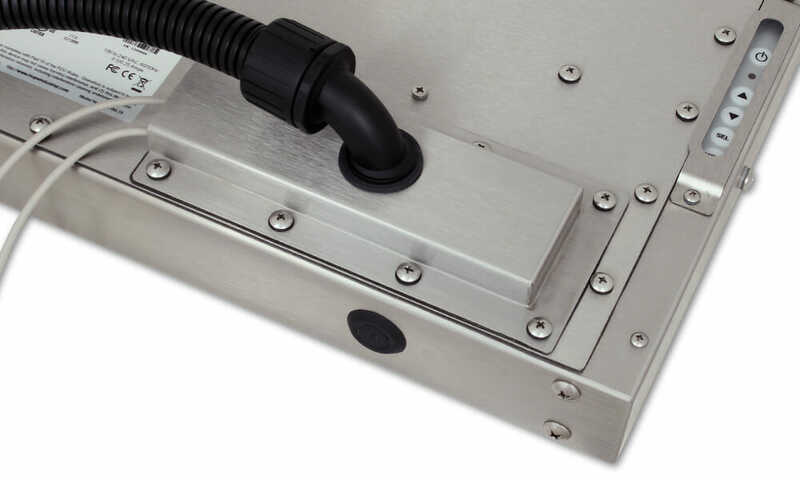 To keep our Universal Mount Displays flexible, we provide a standard cable exit plate pattern on all Universal Mount models, along with a variety of cable exit plates that can be used interchangeably. By far the two most popular are our Compression Glands and our Conduit Cable Exit – both of which provide a fully sealed solution. Many users prefer a Conduit Cable Exit for routing cables from the display to either the top of a pedestal mount or to a nearby enclosure or wall. Combining a Conduit Cable Exit with our popular Compression Gland adds even more flexibility since peripheral cables (generally a mouse, barcode scanner, or printer) can enter the sealed display through the Compression Gland, with the cables then routing through the conduit to the computer. This is particularly useful with our line of monitor-mounted KVM Extenders, which provide two free full speed USB 2.0 ports. A USB peripheral can be placed near the display with the cable routing inside the enclosure to the KVM Extender.